These pages are produced in collaboration with Real Estate Magazine Thailand, the Pattaya-based magazine which industry insiders regard as the main source for news in this dynamic and fast-growing city where property investment is positively booming. 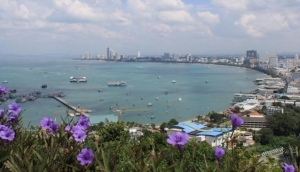 Property in Pattaya is on the up in every sense of the word. High- and low-rise condo blocks are being launched faster than local property agents can keep count. And there is no shortage of housing developments for those who like to keep their feet on the ground.The reasons for this accelerated growth are many and varied. * Prices in this Eastern Seaboard city are generally lower than in many Westernised parts of the world* A new highway linking Pattaya with the still-developing Suvarnabhumi main international airport and Bangkok itself was finished comparatively recently which has dramatically reduced travelling times* The city is now home to quality shopping malls and entertainment complexes* Internationally branded hotels are opening here* And that's without mentioning the great climate, nice people and mouth-watering food.Pattaya is growing up and rapidly attracting more and more families seeking a holiday retreat, a retirement home or a sound investment. It delivers the good life right round the clock.